Other: Avril guest-starred in this video alongside fellow Canadian buddies Sum 41 for the band Treble Charger's video. She basically just flicked off the camera. Other: MTV did a Making The Video special for Sk8er Boi. Avril had a little crush on Sk8er Boi (Jeremy Heisler). 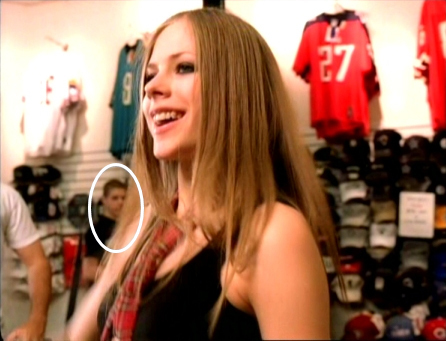 Michelle Lavigne was said to be in this video. Avril's brother Matt is in this video. He is the one driving the car. Other: Avril came up with most of the concept to this video. There was an alternate ending to this video: at the end where she kicks open the door, her band members are there waiting to greet her and Evan gives her a little hug and they all leave the club. Other: MTV did a Making the Video special for Losing Grip. Avril flipped over once while shooting the stagediving scene and they had to stop shooting that scene and used some extras as examples so the crowd could get used to holding people up. The guy at the end of the video who fell during the stagedive was one of those who were used to get the crowd used to carrying people. Extras ate pizza 2 days of shooting. So did Avril. Other: Shows footage from war victims and Avril recording the song. Other: The concept was Avril follows around some jerky guy and she's everywhere. This is the only video that doesn't include her band. Avril also cut her hand while punching the mirror. Other: Avril's friend Monique is in this video. Other: Avril's friend Monique is in this video. This was Avril's first time acting in a video. Other: The pink slime that comes out of the walls at the end stayed in Avril's hair for a few days. Omlouvám se, že jo to v angličtině, ale myslím, že tomu snad všichni rozumí!! !